Probably the most common mistake for people to make is to think that London Bridge is the more picturesque Tower Bridge next to the Tower of London. The real London Bridge isn’t that far from Tower Bridge though – it’s the next one along to the west. 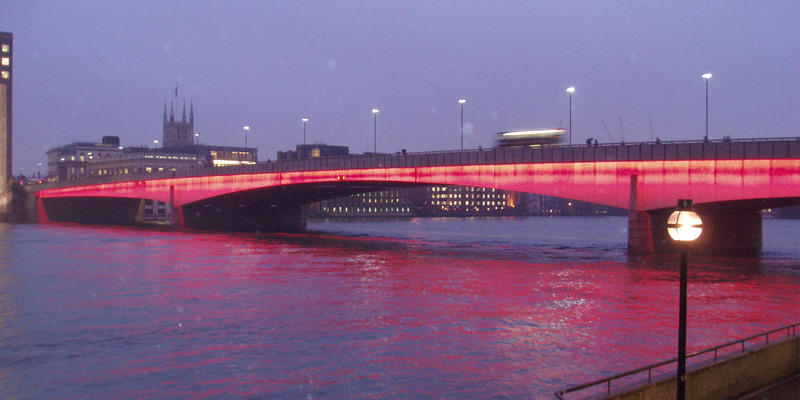 Crossing the River Thames, the foot and road bridge connects the City of London with Southwark. 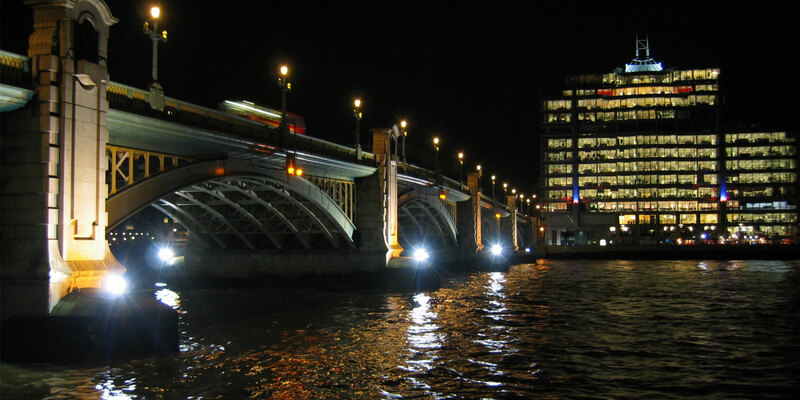 Until 1749, when Westminster Bridge was built, London Bridge was London’s first and only bridge across the river. There’s some evidence to suggest that the Romans built the first bridge in the location, after they conquered Britain in AD 43. In 993, a group of monks constructed a timber bridge there, which lasted until 1093, when it was swept away. A second timber structure built in its place was destroyed in a fire. In 1176, a priest and engineer, Peter de Colechurch, replaced it with a stronger stone bridge. Colechurch’s bridge took 30 years to build and stood for a further 625 years. It had 19 piers, built on foundations made of rubble, which were held in with several rows of closely-spaced pilings made of elm wood. Pilings are heavy posts put into a riverbed to support the foundations of a bridge. Having so many piers created narrower channels in the river, making the water flow through faster. This was damaging to the bridge, as the strong current had a scouring action against the bridge’s foundations, which increased the rate of erosion. The seventh span from the south end was a timber drawbridge, which opened up to let sailing ships through. A span is the distance between two supports for a bridge. Many shops and houses were built along the rest of the bridge. When Westminster Bridge was built, it posed a threat to the toll revenue of London Bridge. It was therefore decided to improve London Bridge by removing all the houses and one of the piers, to make the road over the bridge wider, as well as making space for river traffic. As maintenance costs of the bridge continued to rise, in 1800, a select committee of the House of Commons recommended rebuilding the bridge. John Rennie designed the new bridge, but died before it was built, so it was left to his sons, Sir John and George, to carry out his plans. Work began on the bridge in 1824, and the first stone was laid on 15 June 1825. The bridge was officially opened on 1 August 1831 by King William IV. It had much fewer arches than before, which allowed the Thames to flow through at a slower rate. The bridge was 67ft 6in wide and made out of granite. Its piers were supported by nearly 2,000 timber pilings. Rennie’s bridge cost £1.4m (£154m in 2018). Increased pedestrian and vehicular traffic in 1964 meant that a wider bridge was needed. However, engineers Mott, Hay & Anderson found that a wider bridge would need stronger foundations. This led to a new, three-span, concrete bridge being created in its place, and this is the bridge we see today. The width of today’s bridge is 107ft. It has a centre span measuring 340ft, and two 260ft side spans. With only three spans, London Bridge also now has even fewer piers, which created improved, wider navigation channels for river traffic. It has two piers in the tideway, compared to four in Rennie’s bridge. The headroom under the bridge was also increased by 2ft 3in. The design, as I have already observed, was made by my father, but no detailed working drawings, specification, or estimate had been prepared by him; it fell to my lot, therefore, to do this. about his father, also Sir John Rennie, who died before his designs for the 19th century bridge were put into action. 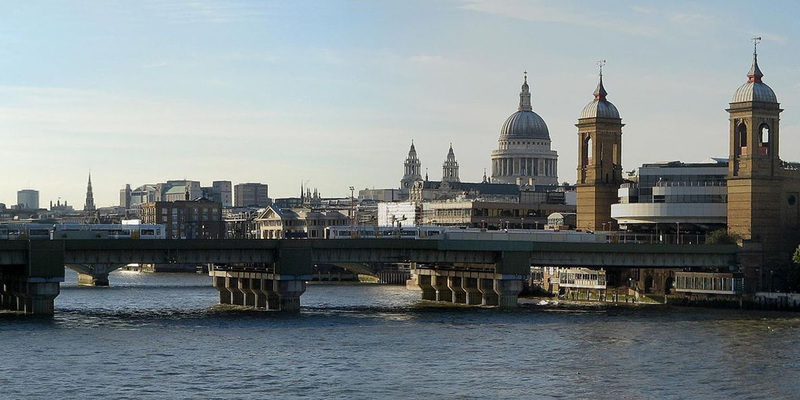 As the first bridge, and first road bridge, in London, the historic significance of London Bridge is clear. It provided the first-ever permanent crossing of the River Thames for early people, horse and wheeled traffic, and now for vehicles, too. Before the bridge, people had to rely on ferries to cross the river. 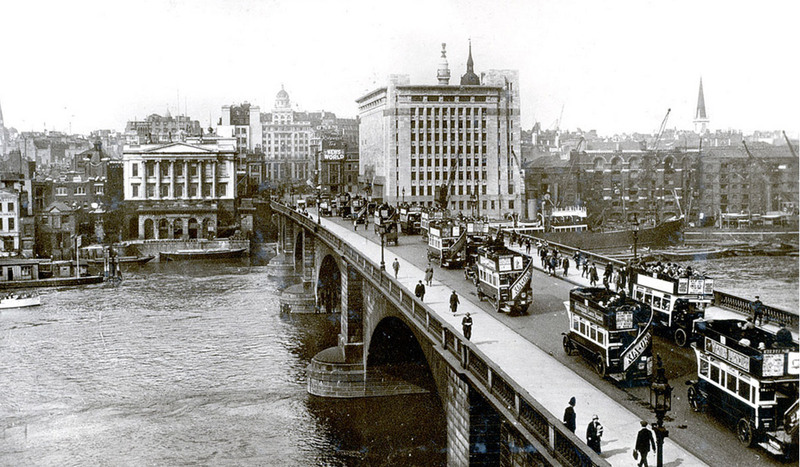 It was such a well-used bridge that it led to Southwark Bridge being built to try to relieve the congestion. It connects major road routes north of the river to those to the south. In engineering terms, it demonstrates the progress in materials used in bridge building – from the early timber to the now much stronger and longer-lasting concrete and steel. The superstructure – the part of the bridge that sits on the foundations and carries the traffic - of the current bridge was designed as four, pre-cast box beams (like a hollow box). There was a strict requirement for the bridge to remain open as much as possible during its rebuilding. The traffic congestion and limited working space at the bridge meant that the precast box parts were brought up the river by barge from the casting yard in Surrey Commercial Dock. A temporary gantry (a bridge-like overhead structure with a platform to support equipment such as a crane), built across the river on column supports, was used to put the precast box units in place. The gantry was able to carry one box of the new bridge at a time and move it sideways into position. The box units were then connected with joints made of concrete. There once stood a chapel dedicated to Thomas Beckett on London Bridge. Many fires damaged London Bridge, even in its stone construction, including the Great Fire of London in 1666. The heads of beheaded traitors used to be mounted on spikes and displayed on the bridge. Part of London Bridge used to be a drawbridge. Civil engineer John Smeaton advised on the building of the bridge. Thomas Telford, ICE’s first president, submitted a design for a new London Bridge, but lost out to Sir John Rennie. Telford’s design for a cast iron arch was considered too “bold”. The granite face work and parapets of the old bridge were sold to McCulloch Properties, Inc, of California, and was rebuilt on a new bridge structure at Lake Havasu City, Arizona. In 1984, HMS Jupiter, a British warship, crashed into London Bridge. This damaged the ship as well as the bridge.